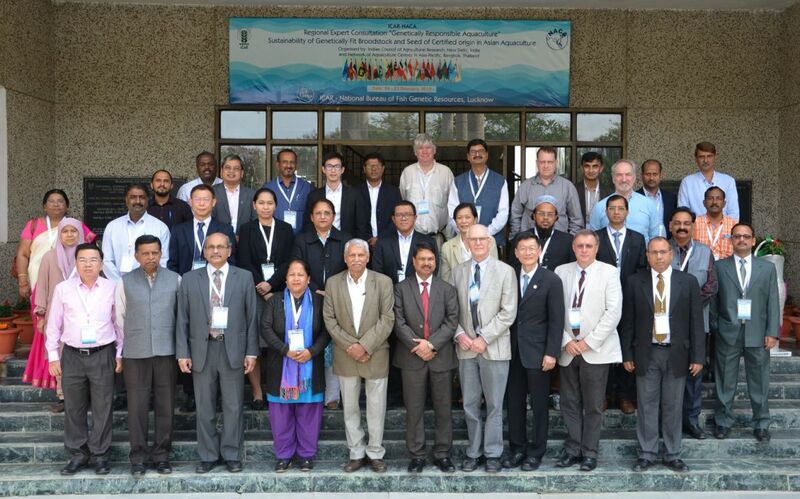 A Regional Expert Consultation on Genetically Responsible Aquaculture was convened by the ICAR National Bureau of Fish Genetic Resources, India, from 26-27 February. The consultation was co-organised with NACA. 36 experts attended from throughout the region. Certification and standards for the production of quality seed. The development of field-validated protocols for testing the origin, genetic composition and inbreeding of seed. Verification of origin though the use of molecular markers. Safeguarding farmed stocks from genetic erosion. The immediate objective of the consultation was to discuss mechanisms for establishing quality seed production systems to improve hatchery and on-farm genetic diversity. Such systems are envisaged to include verified seed and broodstock, biosecure procedures for germplasm exchange, and quantifiable standards to empower farmers and regulators. A long-range objective is to establish networks of registered, small broodstock holdings. Linked via IT systems, the networks will form a virtual global aquaculture gene pool that can, collectively, sustain high genetic diversity, environmental resilience and long-term capacity for adaptation, while checking inbreeding depression. There is a widespread perception that inbreeding and genetic erosion is leading to a decline in productivity in aquaculture. However, it is difficult to separate the impact of genetic erosion from that of other factors such as poor husbandry, disease and environmental issues. To date, the evidence has largely remained anecdotal. The use of genetically improved or specific pathogen free varieties in aquaculture is relatively uncommon, compared to terrestrial livestock industries. Animal breeders have few rights, compared to plant breeders. There are presently no convenient and validated assays or standards available for testing genetic composition and inbreeding. The issue is complicated by the unauthorised practice of "copying" or multiplying improved seed by third parties, without technical supervision. This may not only reduce performance but may also increase susceptibility to disease, particularly in shrimp. The development of standards and certification processes, protocols for assessing inbreeding and origin of seed, and improved frameworks for managing intellectual property rights are expected to help bring aquaculture up to speed with other livestock sectors. Patrons of the consultation were Dr Trilochan Mahapatra, Director General, ICAR and Secretary, DARE; Dr J.K. Jena, Deputy Director General, ICAR; and Dr Cherdsak Virapat, DG, NACA. The consultation was convened by Dr Kuldeep Lal, Director, NBFGR and Dr Roger Doyle, President of Genetic Computation Ltd. FAO was represented by Dr Graham Mair.